Here we are with reason #33 already. I've got some tips and a video of our new Travel Journal using the Adventure Awaits collaboration from The Cherry, Made By Keuntje and Throwing Some Scraps Around as well as an important announcement. "You are so easy to love." is today's quote. If you don't like our journaling, you can always use our blank cards. Some of us are using the blank cards to write on and crop in our pictures for the other side. I'd love to see what you're doing with these freebies! Share them here or in our group. I made a really, really fun Travel Journal using our Adventure AwaitsCollection in the Scrappy Sisters shop. It's amazing how much better a page or printable can turn out when you use the correct settings on your printer and GOOD paper. I used hp professional photo paper 200 /200g. This kind of scrapbooking might be very appealing to you if time is of the essence. I used the templates in the collection and it scrapped up so fast. Let me show you a few images. I bet you have some great city trip or vacation pics that would look awesome in this book. Just look at that close up. What a great, realistic feel and you see what I've got for binding?! How incredibility easy is that? This way you can add or take out pages really easily. Let's go through the steps so you can see how quick and easy it is to make an album like this Travel Journal. Scrap up those templates from the collection. You can see the preview, in the bottom, middle...I've got loads of photo spots in these templates. I've provided this folded look shadow to give your digital pages a realistic effect, but if you are going to print and actually fold the page, then ya won't need it. Though, I did just leave it on my book. I also switched up my templates for extra pages. I took this template because I wanted that left page again. Well, similar. Let me show you. I deleted all of the layers of the right side the page except that blue ring. Then...selected all of the layers from the left side. I ditched a few of the word bit spots and now I've got another, different page! This is how one of the pages look digitally. I always print from my computer's "preview". It never comes out right in PSE, for some reason. I love all of the settings my printer has, too. Check it out. I'll walk you through. I open the document or page I want to print, in "preview" and choose "print". Then I choose what settings I want. Choose something like "best" or "fine" or do a test and see if you can even see a difference. I can also choose what kind of paper type as well as how thick it is. I always recommend using a paper with shine or gloss. This paper isn't that shiny, but the results are super. Once you've printed it out (make sure it's the way/size you want it.). I can see exactly how it is going to come out in my window and make changes right in this program if necessary. Perfection! You can see it in the example above. After printing, cut out any excess paper you don't want around your page, fold and voila! I just cut off the edges of only two sides. I often like to have the white border. I folded this page the other way, giving my book a cover both front and back. Adhere your pages back to back if you like. This way you won't have the plain white pages in your book. It'd look pretty cool if you adhered your pages to coordinating colored paper, too. You could journal there as well or stick a few more pictures or memorabilia. My rigid paper glued to yet another piece of paper makes a very rigid book! The rubber bands I used were about 6 inches long and they fit like magic. I've seen colored ones on the internet, too! If you are totally into hybrid, then check out our newest printable scrapbooking kit, School Rules. It's a class act! We will definitely see you back next week for Digital Scrapbooking Weekend. It's going to be absolutely amazing! Did you hit us up yesterday? No?! Then jump back there grab the fabulous freebiesand check out our inspiration and new Canadian inspired scrapbooking pack. Thanks for hanging with The Cherries! I've added another coordinating pack to our Au Naturel Collection in a Canadian form. 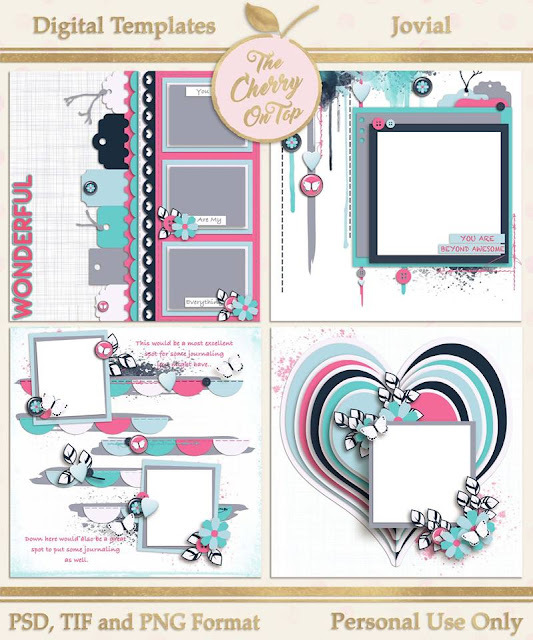 Check out all of the packs, get a gander at our fan-tab-ulous scrapbooking pages, see what freebie Cherry fans have chosen for this and get that new calendar. As you can see, I've used the new Canadian edition to the collection, for the new calendar. Loving the natural, woodsy feel with a sweet pop of red. I'm wondering if anyone has printed out their calendars and if so, what are you doing for binding or display? I use a huge clip to keep my pages together and hang them all together on the wall, in the kitchen. Ha! I didn't realize, but this color palette for October is the same as my cottage style kitchen. What do ya know!? Next time, I should consider laminating my printables. The kitchen can get a bit messy and I might be able to use a dry erase marker on it. Hmmm...food for thought. I've got a couple of pages to show off with the Canadian pack and wanted to show off a few more with Au Naturel. Of course, you save money by buying the collection, but if you've already purchased the travel and or Au Naturel pack, then you can purchase the new pack in my shopat Etsy where all of the packs are sold separately. Some family of ours, from Canada came over to Europe for a visit and they bought us presents! I usedMade By Keuntje's fabulous templatesfor this page. I showed off several more examples with them, last week. Scrappy Sister Ruth, from Canada was sweet enough to scrap these two pages for me. She even used my Banner Bananastemplates for the first one and Free Timetemplates, too. Here's my page using another fabulous template from Throwing Some Scraps Around. I had a coordinating freebie for Au Naturel. If you missed it, click on the preview. It's still live. I reckon it's a little slow this week in DigiLand due to the coming of Digital Scrapbooking Day! Whoo hoo! I and the other ladies at Scrappy Sisters have all kinds of awesomeness planned. Stay tuned for more info and be prepared for some major inspiration next. I did something a little different this week. I asked my group members to choose this week's freebie. They had a choice of cluster, frame cluster or quick page and this was what they have chosen. I try to keep things active and fun in the group. Come on over and hang with us some time. I show off exclusive freebies and give treats exclusively to the group. This hop around will include my NewsLetter, the groupand the blog, right here. You will not want to miss any of these parts. Sign up and join if you've not already. Here's a sweet free template for you from Made By Keuntje. Click on the image and get whisked away to her page and look for the "Freebie" in the tabs, on the left. Tomorrow, I'll have the 52 Reason's free printable ready for you as well as a tutorial for our Travel Journal made with the collaboration, Adventure Awaitsfrom Throwing Some Scraps Around, Made By Keuntje and The Cherry. Here is the freebie that was most popular. I just loved all of the participation and pretty much expected that a quick page would win. Hehehe...Thanks for all of you who voted! Thanks so much for stopping by The Cherry. We'll see ya next week for the scrap Extravaganza!!!! I'm back with the next reason and some really, really other exciting printables so you can get totally scrap-a-licious! Today's reason is, "You let me be me." I like that and think it is really important that we can be ourselves with the ones we love and that we also let our loved ones be themselves, too. If you are needing all of the other reasons and or the blank cards, visit last week's blog. Now for some more exciting news! I've recently released a digital school themed collection, School Rules. You get a ton of stuff in there! 50 elements, 25 papers, an alpha, 12 journal cards and FIVE templates. That is a whole lot of scrappy goodness and all for just $7. I thought I'd design a printable version of the collection as well. I'm giving away a sample on today's blog. You'll get one sheet of embellishments, 3 journal cards and three papers all in jpg format. So get out your scissors or cutting machine, the glue and get scrappy! Scroll to the bottom for the link. I do have a lot more for this collection, for sale in my shop at Etsy. There you can get 2 sheets of embellishments, 10 design papers, a capitalized alphabet, 12 journal cards and four quick pages. You'll receive jpg and png formats. That should go through most cutting machines. All of that for just 4.99! I'm figuring since my color palette is very basic, you'll have the solids in your scrappy stash. Even just some red, white and black solids would give you a nice variety. I've designed this printable kit with an 8x8 album in mind. So you can shrink up for smaller albums or projects or expand or enlarge for larger pages like 12x12 or other projects. It will be easy to print this way, too. Aren't the quick pages so cute?! Since the four pages are in png format, you can add your pictures in your digital software program or you can print and carefully cut out the photo spaces. I left them very, very simple. I also chose embellishments that are fairly easy to cut out if you don't have a cutting machine like Cricut or Silhouette. To get the very best print results, check out this blog. Keep in mind, when printing that all printers are not created equal and the kind of paper you choose as well as the print settings you choose will have a big impact on your results. I've got something a bit different in the shop this week. These Halloween words Art Titles come in png and svg formats. Just think of what you can do with them! Keep scrolling for ideas. My scrappy sister friend came over and she put these through her Brother cutting machine on the spot. She could NOT wait! Hehehe...I was so thrilled with the result. They looked fantastic. She's going with the pillow idea. Think of invitations for a Halloween party, gruesomely gorgeous scrapbooking pages or party favors and posters. Click here for the free, printable sample of School Rules. I'm so glad you've joined us for our, Why I Love You challenge and I hope you'll give our new, printable scrapbooking kit a try, too. I've got my Travel Journal with the Adventure Awaits collection on tap for next week. There will be many tips and my usual step by step tutorial through images. I've got a videoof the page through if you want to check it out. It's under 3 minutes! I've changed up the challenge to Saturday's hybrid spot. It seemed to fit a lot better there. Thank you for checking out The Cherry. I've got some templates ready for the shops, page inspiration, links to free stuff, new goods from other Digital Designers and...drum roll please...drrrr.....an announcement about tomorrow's blog with a terrific free printable for our Hybrid Saturday spot. I'm so, so glad you're here. Enjoy today's blog. As you may have seen, I've got a new printable scrapbooking kit in my shop at Etsy, Kreative Design Studio. Here's a glimpse at some of the goodies you get in that pack. 2 sheets of embellishments (8x11 inches), 10 printable papers (8x8 inches), 12 journal cards (on three sheets 8x11 inches), a sheet of capitalized letters (8x11 inches) and four quick pages. In the printable kit, you get formats jpg and png. This way you can just print the pages and grab the glue or you can customize digitally! If ya wanna keep it digital. This is the collection. I'm keeping it priced at $7 for now and you can get it in the Scrappy Sisters shop. The alpha and journal cards are in it and the templates are cute enough to turn into quick pages. Last week's blog is FULL of page inspiration. The templates just put into the shops may look familiar to you. I gave them away this summer tonewsletterrecipients. It pays to subscribe so do so, today. This way you can keep up to date with the busy Cherry schedule and ya won't miss the awesome free stuff. Digital Scrapbooking Day is on the way and as usual, social spot fans will be spoiled with freebies, sales, events and challenges. Now is your chance to grab these super versatile templates. Seriously! You can use them for any kind of theme, photos or kits and collections you have in your Digi Stash. Check out what I and my team have done. I often go back to older kits. We just took this picture a few weeks ago. I wanted to show off a bright, quirky romantic kind of kit. Made By Keuntje's xoxowas a perfect fit! That's my oldest on the coast in the south of France, this spring. I used a gorgeous kit from Kim Cameron Designs, Castles In The Sand. More fun goodies from Kim's flamingo themed kit, Flamingo Bay. They are all the rage! Moving on to other designer's goodies. I'm so exciting to show off my pages. They came out really great. Using templates are such a super way to get started. Bejeweled templates are so stunning! You won't know which one to work with first. I could certainly scrap up ALL of them AND she has two packs. Dana worked really hard on these and you'll see that, right away. Even the shapes she used and designed are fabulous. I left the sparkle on my first page. I love it. This kit may look familiar. I just keep going back to it. It's so beautiful. Kim Cameron's My Storyhas a gorgeous, soft and pretty palette and very thoughtful embellishments, too. Whispering...Last time I looked it was still on sale for just $3! As soon as I saw Dana's template, I wanted to go with a bright, really fun maybe even blingy kit and low and behold, my gal Jamie from The Kit Cart Designs came up with this one. Hello?! Hold the phone!! Never Grow Upis full of glimmer, fantasy and magic. She's got some other Disney like kits that might appeal to you. Pop over and look through her shop. Check out Jamie's coordinating freebie with Never Grow UP. Head over to her group and grab it! Don't worry! I've not forgotten your free printable 52 Reasons card for this week. I moved this year long challenge to my Hybrid Saturday spot. It seems to make a lot more sense there. I'm doing the mini album digital style, after all. Though, you can break out the scissors and double sided tape for yours. Look for it tomorrow along with our fabulous free sample pack of School Rules. If you've got a special cutting machine like Cricut, Brother, Silhouette or other machine then my SpookyTitle art might appeal to you. It's already in the shop waiting to see what kind of awesomeness you've got for it! Before you go, I wanted to tell you about Scrappy Sister's Manic Mondays. Two times a month, designers choose an item or several items and place them on sale for 50% off. This week, I put my Outline Odyssey templates in the Scrappy Sisters shop. Keep that in mind if you're like me and prefer to buy things when they are on sale. Our newsletter there and our groupwill help remind you. We still need to take a look at our last freebie as well as other digital freebies from DigiLand. This was our freebie from last week. It's a Frickie! Use if to frame up an entire page or as a cluster frame or design a pretty card or poster. Here are a few more freebies. JoCee keeps her fans busy in her group. See what you can get there! Aimee Harrison always has fab freebies on her FB Page and blog. How is this for gorgeous freebies? Click on any three of these previews and find out how to get these beauties. Creative Fabrica has tons of awesome freebies! Just look at all of this awesomeness! I don't even know where to start with this one. Here are a lot of free fonts. I just love script font and that Bomb Diggity looks so cute. Well, how set are you with scrappy inspiration and goodies to scrap?! Come on back next week for more spoiling and don't forget to come back tomorrow for the free printable scrap kit. Thanks for hanging with The Cherry.